Scientists have been buzzing over the prospect of water flowing on Mars for decades, enchanted by the idea that it's capable of supporting lifeforms. But to date, there has been little evidence to prove that there's any substantial amount of liquid water on the Red Planet -- until now. On Wednesday, researchers said new radar scans appear to reveal a vast, 12 mile "lake" flowing beneath the planet's polar ice cap. New radar scans taken by the European Space Agency's Mars Express orbiter have detected what astronomers think is a substantial stretch of water flowing beneath surface layers, and it's renewing hope that any lifeforms that may have once been present on the planet's surface may still be there in the pocket of liquid. It's also a promising sign that suggests there is even more water to be found elsewhere underground. 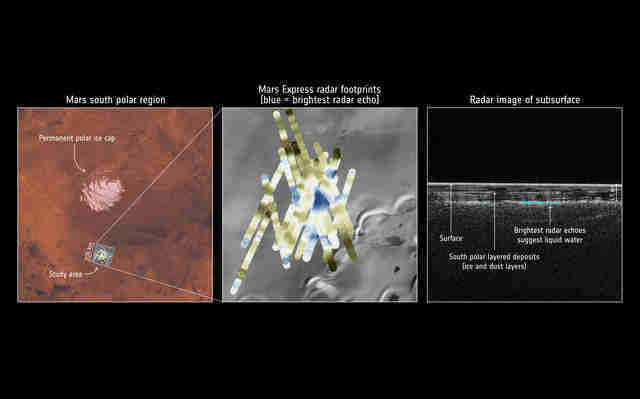 The discovery is a long time coming, as the orbiter has been flying around and around Mars since 2003, scanning various areas to investigate the planer's interior structure and composition. The orbiter has been taking repeated and specific scans of the area in question for quite some time after detecting multiple layers beneath the surface, and scientists finally have enough evidence to say it's a patch of liquid. It's not yet clear what exactly the liquid is, but experts are all but certain its salty water, since billions of years ago, the planet was dotted with seas. 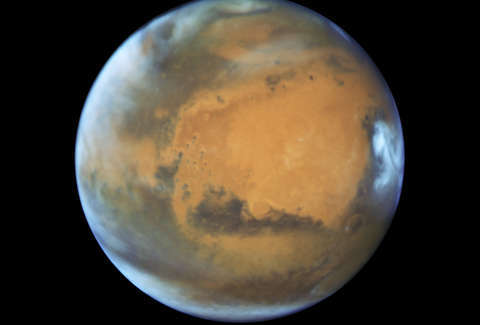 Before everyone gets too excited, the findings will need to be confirmed by future expeditions, and the 2020 Chinese Mars Mission may be the one to do it, according to Popular Mechanics. Once confirmed, the investigation can look into whether or not there are any lifeforms present in those frigid subterranean seas, though many scientists are already convinced there are because lifeforms have been detected in similar settings beneath the ice sheets of Greenland and Antarctica here on Earth. Then again, if life is detected, that begs yet another important question: what brave souls are going to be the ones to volunteer to check it out in person when the time comes?